spun :: Rambo Combo, originally uploaded by earthchick. This is part of a delicious project that’s on hold for now. 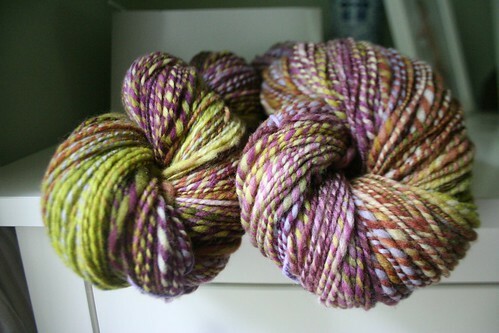 I spun this up last May – a combo spin of 4 oz. FLUFF Rambouillet in “Ripe Eggplant” plied with 4 oz. Hello Yarn Rambouillet in “Pallid” for 623 yards light worsted 2-ply – and I am pairing it with another yummy handspun for a long-term from time-to-time project. I’ll share the project soon, but for now I just enjoy this shot of squooshy yarn! The yarn is beautiful. I am trying to ignore the call of a spinnig wheel but I am weakening more and more.